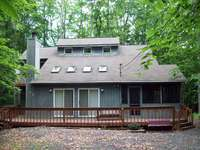 Rick's Pocono Blog: Secluded Contemporary Home For Rent in Arrowhead Lakes! 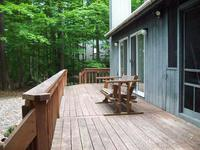 Secluded Contemporary Home For Rent in Arrowhead Lakes! Fabulous Contemporary Home Centrally Located in the Amenity Filled Arrowhead Lakes Community. This home is Located on Lehigh Drive which is great in location in Arrowhead because of it's seclusion and privacy. It is also great in location because of how close it is to the many amenities in Arrowhead Lakes such as the Heated Swimming Pools, Tennis Courts, and Sandy Beaches! This is a Beautiful Home that comes with your basic living requirements, appliances, and a few extras as well. 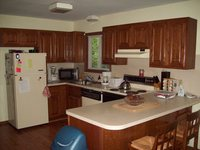 Home includes Washer/Dryer, Dishwasher, Cable T.V, High Speed Internet, Wood Fireplace, and a Propane Grill for your Perfect Pocono Cookouts and Picnics. This home sleeps 10 Comfortably having 1 Queen and 2 Futons on the First Floor, and 1 Double and 1 Queen on the Second Floor. Arrowhead Lakes itself is in a Great Location being only a 15 minute drive from some of the BEST Pocono Spots and Resorts including Big Boulder/ Jack Frost, Split Rock Resort, H20 Waterpark, and Pocono Raceway. This is truly a great oppurtunity for fullfill a Family and Friend Filled Pocono Mountain Experience! Arrowhead Lakes Community - Arrowhead Lakes is a Pristine Amenity Filled Community that brings Family and Friends together in the Pocono Mountains all year round. Amenities for Arrowhead Lakes include 3 Heated Swimming Pools, 4 Sandy Beaches with Boat Docks, Tennis and Basketball Courts, a Community Welcome Center with a Fitness Room, Pool Table, Ping Pong Table, Library, and Computers with Internet Access. Arrowhead is full of life as well with such wildlife including Whitetail Deer, Chipmunks, Foxes, Turtles, Black Bear, and a variety of Birds. This Community backs right up to Brady's Lake State Gamelands as well with 21,000 Acres of Pa State Gamelands.